Roughly half a century ago, Cornell astronomer Frank Drake conducted Project Ozma, the first systematic SETI survey at the National Radio Astronomy Observatory in Green Bank, West Virginia. Since that time, scientists have conducted multiple surveys in the hopes of find indications of “technosignatures” – i.e. evidence of technologically-advanced life (such as radio communications). To put it plainly, if humanity were to receive a message from an extra-terrestrial civilization right now, it would be the single-greatest event in the history of civilization. But according to a new study, such a message could also pose a serious risk to humanity. Drawing on multiple possibilities that have been explored in detail, they consider how humanity could shield itself from malicious spam and viruses. The study, titled “Interstellar communication. IX. Message decontamination is impossible“, recently appeared online. The study was conducted by Michael Hippke, a independent scientist from the Sonneberg Observatory in Germany; and John G. Learned, a professor with the High Energy Physics Group at the University of Hawaii. Together, they examine some of the foregone conclusions about SETI and what is more likely to be the case. To be fair, the notion that an extra-terrestrial civilization could pose a threat to humanity is not just a well-worn science fiction trope. For decades, scientists have treated it as a distinct possibility and considered whether or not the risks outweigh the possible benefits. As a result, some theorists have suggested that humans should not engage in SETI at all, or that we should take measures to hide our planet. In addition, assuming that an alien message could pose a threat to humanity makes practical sense. Given the sheer size of the Universe and the limitations imposed by Special Relativity (i.e. no known means of FTL), it would always be cheaper and easier to send a malicious message to eradicate a civilization compared to an invasion fleet. As a result, Hippke and Learned advise that SETI signals be vetted and/or “decontaminated” beforehand. In terms of how a SETI signal could constitute a threat, the researchers outline a number of possibilities. Beyond the likelihood that a message could convey misinformation designed to cause a panic or self-destructive behavior, there is also the possibility that it could contain viruses or other embedded technical issues (i.e. the format could cause our computers to crash). They also note that, when it comes to SETI, a major complication arises from the fact that no message is likely to received in only one place (thus making containment possible). This is unlikely because of the “Declaration of Principles Concerning Activities Following the Detection of Extraterrestrial Intelligence”, which was adopted by the International Academy of Astronautics in 1989 (and revised in 2010). As such, a message that is confirmed to have originated from an ETI would most likely be made available to the entire scientific community before it could be deemed to be threatening in nature. Even if there was only one recipient, and they attempted to keep the message under strict lock and key, it’s a safe bet that other parties would find a way to access it before long. The question naturally arises then, what can be done? One possibility that Hippke and Learned suggest is to take a analog approach to interpreting these messages, which they illustrate using the 2017 SETI Decrypt Challenge as an example. This challenge, which was issued by René Heller of the Max Planck Institute for Solar System Research, consisted of a sequence of about two million binary digits and related information being posted to social media. However, where messages are made up of complex codes or even a self-contained AI, the need for sophisticated computers may be unavoidable. In this case, the authors explore another popular recommendation, which is the use on quarantined machines to conduct the analysis – i.e. a message prison. Unfortunately, they also acknowledge that no prison would be 100% effective and containment could eventually fail. Basically, when it comes to the search for extra-terrestrial intelligence, the rules of internet safety may apply. If we begin to receive messages, we shouldn’t trust those that come with big attachments and send any suspicious looking ones to our spam folder. Oh, and if a sender is promising the cure for all known diseases, or claims to be the deposed monarch of Andromeda in need of some cash, we should just hit delete! The core of the Milky Way Galaxy has always been a source of mystery and fascination to astronomers. This is due in part to the fact that our Solar System is embedded within the disk of the Milky Way – the flattened region that extends outwards from the core. This has made seeing into the bulge at the center of our galaxy rather difficult. Nevertheless, what we’ve been able to learn over the years has proven to be immensely interesting. For instance, in the 1970s, astronomers became aware of the Supermassive Black Hole (SMBH) at the center of our galaxy, known as Sagittarius A* (Sgr A*). In 2016, astronomers also noticed a curved filament that appeared to be extending from Sgr A*. Using a pioneering technique, a team of astronomers from the Harvard-Smithsonian Center for Astrophysics (CfA) recently produced the highest-quality images of this structure to date. The study which details their findings, titled “A Nonthermal Radio Filament Connected to the Galactic Black Hole?“, recently appeared in The Astrophysical Journal Letters. In it, the team describes how they used the National Radio Astronomy Observatory’s (NRAO) Very Large Array to investigate the non-thermal radio filament (NTF) near Sagittarius A* – now known as the Sgr A West Filament (SgrAWF). 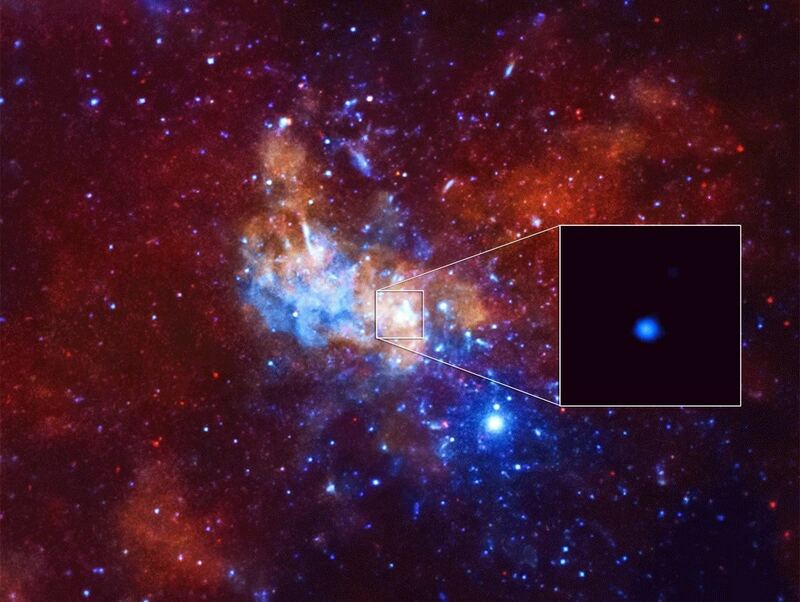 Detection of an unusually bright X-Ray flare from Sagittarius A*, a supermassive black hole in the center of the Milky Way galaxy. Credit: NASA/CXC/Stanford/I. Zhuravleva et al. After examining the filament, the research team came up with three possible explanations for its existence. The first is that the filament is the result of inflowing gas, which would produce a rotating, vertical tower of magnetic field as it approaches and threads Sgr A*’s event horizon. Within this tower, particles would produce radio emissions as they are accelerated and spiral in around magnetic field lines extending from the black hole. The second possibility is that the filament is a theoretical object known as a cosmic string. These are basically long, extremely thin cosmic structures that carry mass and electric currents that are hypothesized to migrate from the centers of galaxies. In this case, the string could have been captured by Sgr A* once it came too close and a portion crossed its event horizon. The third and final possibility is that there is no real association between the filament and Sgr A* and the positioning and direction it has shown is merely coincidental. This would imply that there are many such filaments in the Universe and this one just happened to be found near the center of our galaxy. However, the team is confident that such a coincidence is highly unlikely. Labelled image of the center of our galaxy, showing the mysterious radio filament & the supermassive black hole Sagittarius A* (Sgr A*). Credit: NSF/VLA/UCLA/M. Morris et al. All of these scenarios are currently being investigated, and each poses its own share of implications. If the first possibility is true – in which the filament is caused by particles being ejected by Sgr A* – then astronomers would be able to gleam vital information about how magnetic fields operate in such an environment. In short, it could show that near an SMBH, magnetic fields are orderly rather than chaotic. This could be proven by examining particles farther away from Sgr A* to see if they are less energetic than those that are closer to it. The second possibility, the cosmic string theory, could be tested by conducting follow-up observations with the VLA to determine if the position of the filament is shifting and its particles are moving at a fraction of the speed of light. If the latter should prove to be the case, it would constitute the first evidence that theoretical cosmic strings actually exists. It would also allow astronomers to conduct further tests of General Relativity, examining how gravity works under such conditions and how space-time is affected. The team also noted that, even if the filament is not physically connected to Sgr A*, the bend in the filament is still rather telling. In short, the bend appears to be coincide with a shock wave, the kind that would be caused by an exploding star. This could mean that one of the massive stars which surrounds Sgr A* exploded in proximity to the filament in the past, producing the necessary shock wave that altered the course of the inflowing gas and its magnetic field. All of these mysteries will be the subject of follow-up surveys conducted with the VLA. Most galaxies have a super-massive black hole at their centre. As galaxies collide and merge, the black holes merge too, creating the super-massives we see in the universe today. But one team of astronomers went looking for super-massives that aren’t at the heart of galaxies. They looked at over 1200 galaxies, using the National Science Foundation’s (NSF) Very Long Baseline Array (VLBA), and almost all of them had a black hole right where it should be, in the middle of the galaxy itself. But they did find one hole, in a cluster of galaxies more than two billion light years away from Earth, that was not at the centre of a galaxy. They were surprised too see that this black hole had been stripped naked of surrounding stars. Once they identified this black hole, now called B3 1715+425, they used the Hubble and the Spitzer to follow up. And what they found tells an unusual story. The super-massive black hole in question, which we’ll call B3 for short, was a curiosity. It was far brighter than anything near it, and it was also more distant than most of the holes they were studying. But a black hole this bright is typically situated at the heart of a large galaxy. B3 had only a remnant of a galaxy surrounding it. It was naked. James Condon, of the National Radio Astronomy Observatory (NRAO) described what happened. “We were looking for orbiting pairs of supermassive black holes, with one offset from the center of a galaxy, as telltale evidence of a previous galaxy merger,” said Condon. “Instead, we found this black hole fleeing from the larger galaxy and leaving a trail of debris behind it,” he added. Condon and his team concluded that B3 was once a super-massive black hole at the heart of a large galaxy. B3 collided with another, larger galaxy, one with an even larger black hole. During this collision B3 had most of its stars stripped away, except for the ones closest to it. B3 is still speeding away, at more than 2000 km per second. Nearly Naked Black Hole from NRAO Outreach on Vimeo. B3 and what’s left of its stars will continue to move through space, escaping their encounter with the other galaxy. It probably won’t escape from the cluster of galaxies it’s in though. Condon outlines the likely end for B3. It won’t have enough stars and gas surrounding it to trigger new star birth. It also won’t be able to attract new stars. So eventually, the remnant stars of B3’s original galaxy will travel with it, growing progressively dimmer over time. B3 itself will also grow dimmer, since it has no new material to “feed” on. It will eventually be nearly impossible to see. Only its gravitational effect will betray its position. How many B3s are there? If B3 itself will eventually become invisible, how many other super-massive black holes like it are there, undetectable by our instruments? How often does it happen? And how important is it in understanding the evolution of galaxies, and of clusters of galaxies. Condon asks these questions near the end of the clip. For now, at least, we have no answers. Condon and his team used the NRAO‘s VLBA to search for these lonely holes. The VLBA is a radio astronomy instrument made up of 10 identical 25m antennae around the world, and controlled at a center in New Mexico. The array provides super sharp detail in the radio wave part of the spectrum. Their black hole search is a long term project, making use of filler time available at the VLBA. Future telescopes, like the Large Synoptic Survey Telescope being built in Chile, will make Condon’s work easier. Condon worked with Jeremy Darling of the University of Colorado, Yuri Kovalev of the Astro Space Center of the Lebedev Physical Institute in Moscow, and Leonid Petrov of the Astrogeo Center in Falls Church, Virginia. They will report their findings in the Astrophysical Journal. Score another point for the National Science Foundation’s Green Bank Telescope (GBT) at the National Radio Astronomy Observatory (NRAO) in Green Bank. They have opened our eyes – and ears – to previously undetected region of hydrogen gas clouds located in the area between the massive Andromeda and Triangulum galaxies. If researchers are correct, these dwarf galaxy-sized sectors of isolated gases may have originated from a huge store of heated, ionized gas… Gas which may be associated with elusive and invisible dark matter. So how did astronomers detect the extremely faint signal which clued them to the presence of the gas pockets? Fortunately, our terrestrial radio telescopes are able to decipher the representative radio wavelength signals emitted by neutral atomic hydrogen. Even though it is commonplace in the Universe, it is still frail and not easy to observe. Researchers knew more than 10 years ago that these repositories of hydrogen might possibly exist in the empty space between M33 and M32, but the evidence was so slim that they couldn’t draw certain conclusions. They couldn’t “see” fine grained structure, nor could they positively identify where it came from and exactly what these accumulations meant. At best, their guess was it came from an interaction between the two galaxies and that gravitational pull formed a weak “bridge” between the two large galaxies. The animation demonstrates the difference in resolution from the original Westerbork Radio Telescope data (Braun & Thilker, 2004) and the finer resolution imaging of GBT, which revealed the hydrogen clouds between M31 and M33. Bill Saxton, NRAO/AUI/NSF Credit: Bill Saxton, NRAO/AUI/NSF. Just last year, the GBT observed the tell-tale fingerprint of hydrogen gas. It might be thin, but it is plentiful and it’s spread out between the galaxies. However, the observations didn’t stop there. More information was gathered and revealed the gas wasn’t just ethereal ribbons – but solid clumps. More than half of the gas was so conspicuously aggregated that they could even have passed themselves off as dwarf galaxies had they a population of stars. What’s more, the GBT also studied the proper motion of these gas pockets and found they were moving through space at roughly the same speed as the Andromeda and Triangulum galaxies. And where there is neutral hydrogen gas, there is fuel for new stars. Astronomers also recognize these new formations could eventually be drawn into M31 and M33, eliciting stellar creation. To add even more interest, these cold, dark regions which exist between galaxies contain a large amount of “unaccounted-for normal matter” – perhaps a clue to dark matter riddle and the reason behind the amount of hydrogen yet to revealed in universal structure. Original Story Source: National Radio Astronomy Observatory News Release.